"Denim giant Levi Strauss said on Tuesday it had designed jeans compatible with the iPod music player, featuring a joystick in the watch pocket to operate the device. "The Levi's RedWire DLX Jeans for men and women, which will be available this fall, also have a built-in docking cradle for the iPod and retractable headphones. Pricing was not immediately available." "Who guitarist Pete Townshend has sort-of backed recent sensational claims that iPod headphones can permanently damage your hearing, the BBC notes. "Giving forth on his website, the sexagenarian guitar worrier declares: 'I have unwittingly helped to invent and refine a type of music that makes its principal proponents deaf,' before admitting: 'My intuition tells me there is terrible trouble ahead.'" PR: Apple's iPod with video gives filmmakers young and old an exciting new way to get their projects seen, and offers iPod owners a great way to discover new talent and independent content. The Flux iPod video Film Festival brings these groups together by creating the first film festival specifically for content formatted to play on the iPod video. All projects under ten minutes are welcome in one of four categories: Student film, Indie film, Family Clips, and Music Video. Not sure what to watch? Use the Flux Movie Engine to get great viewing recommendations for any mood. Need some extras? How about a lighting crew? With 855 online resources and growing, you're bound to find whatever it is you need. Get your short film out to an audience. Submit to the flux and, if you've got what it takes, you'll appear on our weekly webcast. Submission is free. What are you waiting for? ALL ENTRIES MUST BE RECEIVED BY JANUARY 25, 2006. If your project is not already formatted for iPod playback, our partners at R-Cubed Productions offer affordable video conversion services. Submission requires a Flux User Account. Fee for each entry is $15.00 US Dollars, and will be processed online via PayPal. This fee covers all costs associated with your entry, except for any shipping associated with sending your film to The Flux; there are no additional fees. Select entries will be available for download and viewing beginning February 1, 2006. Viewers will be able to vote for their favorite film, and download the films to watch on their own iPods with video selection. PR: Motorola, Inc. today has unveiled the Motorola ROKR E2 - the newest member of the company's ROKR family of music-optimized mobile handsets. Designed for the music enthusiast who wants to carry one device, ROKR E2 lets you take hundreds of your must-have music selections with you - and delivers a world-class wireless communications experience. Motorola is showcasing ROKR E2 as part of its rapidly evolving vision of Seamless Mobility for consumers at the 2006 International Consumer Electronics Show in Central Hall Booth 8545, where visitors can experience innovations that enable enriched wireless communications, home entertainment, and on-the-go productivity. Delivering a powerful mobile music experience, ROKR E2 lets you switch seamlessly between phone calls and music play lists simply by touching a button. Based on a Linux operating system to enhance speed and flexibility, ROKR E2 also features a robust MP3 player compatible with a variety of different audio formats - making this mobile handset a powerful example of what it means to be "the device formerly known as the cell phone." "No matter what consumers listen to - rap, hip hop, country, classical or pop - one thing is for sure, they want their music with them, wherever they go," said Richard Chin, corporate vice president, Global Products Marketing, Motorola Mobile Devices. "Motorola is driving the convergence of music and mobility by combining the device you never leave home without, with the entertainment consumers crave. We're giving people a seamless, mobile music experience with a portfolio of devices like the new ROKR E2 leading the way." ROKR E2 makes loading music simple. Users make a fast connection from the device to a compatible PC using a USB 2.0 cable. Next, they "drag and drop" digital music files from their PC-based music collection directly to the phone. Each song takes only seconds to transfer from the PC to the ROKR E2. With up to 2 GB of optional removable SD(TM) mass memory, ROKR E2 lets you store as many as 500 of your favorite tunes, as well as create and manage playlists. And, when you're ready to listen to what's on the airwaves, ROKR E2 also comes equipped with built-in FM radio functionality. ROKR E2's features are built for ease-of-use. Dedicated music keys on the handset's side and front let you navigate playlists, as well as play/pause, skip backward/forward, and hold. Connect to ROKR E2 via a standard 3.5mm headset or wirelessly via the built-in stereo Bluetooth(R) audio connection. Motorola offers a wide range of music accessories to optimize your ROKR E2 experience including the newly announced O ROKR Eyewear, Motorola Bluetooth DJ Headphones S805, and JBL OnTour(TM) Mobile. Additionally, ROKR E2 comes with airplane mode, allowing you to safely listen while on the ground or in the air. Other multimedia features include a 1.3 megapixel camera for pictures, video capture and playback and SCREEN3 technology for zero-click access to news, sports and entertainment content. ROKR E2 is also part of Motorola's growing portfolio of Linux-based handsets. Open software solutions such as Linux help Motorola create the best mobile experiences for wireless operators and consumers. By leveraging Linux, Motorola can deliver products to market faster, reduce costs and create more innovative products and experiences for mobile music, productivity, and entertainment. The company's first "mid-tier" Linux-based device, ROKR E2 further demonstrates Motorola's commitment to driving Linux-for-mobile innovation across the company's device portfolio. The Motorola ROKR E2 is expected to be available in the first half of 2006. Specific details will be announced upon consumer availability. Motorola is a Fortune 100 global communications leader that provides seamless mobility products and solutions across broadband, embedded systems and wireless networks. In your home, auto, workplace and all spaces in between, seamless mobility means you can reach the people, things and information you need, on the go. Seamless mobility harnesses the power of technology convergence and enables smarter, faster, cost-effective and flexible communication. Motorola had sales of US $31.3 billion in 2004. PR: Harman Kardon, a leading provider of audio products for the home, computer and automotive industries, today announced that the Harman Kardon Drive + Play was honored with the 'Best of Innovations' award as the top vehicle audio electronics product by International Consumer Electronics Show's (CES) Innovations Design and Engineering Awards. Drive + Play is the first fully integrated iPod docking system specifically designed for automotive use. Drive + Play provides complete iPod control including full browsing capability, minimizing distractions for drivers, and can be used with any car's audio system. It has a dash-mounted LCD screen and provides the familiarity of the Apple(R) Click Wheel controller knob. This enables the drivers to easily control playback while keeping their eyes on the road. Drivers can browse by artist, album, song, genre and composer, or simply scroll through playlists to find their favorite song. They can skip ahead to the next track, or play the last one repeatedly from the driver's seat. "Our goal in developing Drive + Play was to offer consumers the most enjoyable way of taking their music on the road," said Mike Giffin, president of the Mobile Systems Division for Harman Consumer Group. "CES sets the standard for the hottest consumer electronics, so we are proud to have been selected for 'Best of Innovations.' The honor echoes strong customer feedback about the functionality and unique engineering of Drive + Play." The CES Innovations Design and Engineering Awards recognize new consumer electronics products that exhibit excellence in form and function. A panel comprising independent engineers, industrial designers and members of the trade press judge newly released products based on their user value, aesthetic design qualities, contributions to the user's life and innovative design. The Industrial Designers Society of America (IDSA) endorses and acts as an advisor to the awards. The 'Best of Innovations' award joins a prestigious and growing collection of accolades that Drive + Play has received. At the July 2005 Macworld Expo in Boston, Drive + Play was named Best in Show - one of just six products given this honor. In December 2005, Drive + Play was named the Plays of the Year for iPod/car integration by Playlist Magazine. Harman Kardon Drive + Play is compatible with all docking iPods including Nano and the all new video iPod. The system includes a wireless FM transmitter, provision for a wired FM transmitter and a 3.5mm audio output jack, which allows the system to be connected to any vehicle, regardless of the make or model. Drive + Play, with a suggested retail price of $199.95, is available in the US at quality retailers and e-tailers nationwide. Drive + Play is also available in both Europe and Asia. PR: PodShop, makers of specialized accessories for portable audio electronics and computing devices, has announced that in response to the US Postal Service's rate increase that took effect on January 8, the company is offering free shipping on its products indefinitely. Christopher Anderson, President of PodShop LLC, stated "With the Postal Service raising their rates, we decided we needed to take action. The best we could come up with was free shipping, worldwide, permanently." The company has offered free shipping promotions in the past, including during last month's busy holiday buying season; the promotion was in fact extended into the beginning of 2006. Anderson continues, "We felt that with the upcoming increase in postage rates, we will be better served by providing our customers with a substantial decrease in shipping costs. The USPS is our primary shipper, and while we will definitely have to absorb more shipping expenses as a business, the customers and consumers are the reason why we are in business in the first place. This is the least we could do for them and to thank them." Free worldwide shipping is available immediate on the company's recently updated iDrops ( http://podshop.com/idrops.html ) product - an all-in-one cleaning, polishing, and scratch removing solution priced at $14.95. iDrops is specifically designed for use on the plastic/acrylic surfaces of Apple's iPod (all models), iBook, eMac, and iMac (G3/G5), Mac mini and Power Mac (G3/G4). The company's first product, PodHolder ( http://podshop.com/podholder.html ) - a clear acrylic stand/display that supports iPod - is available for $9.95, and is also part of the free shipping offering. PR: ezGear has announced the introduction of ezArmor Video Protective Case for the Video iPod. The ezArmor Video is made of 100% anodized aircraft grade aluminum. The case is designed to perfectly fit the profile of the iPod. With a clear protective screen and clickwheel cutout, you get full access to your digital music player while it is in the case. The interior is lined with neoprene to cushion your iPod from impact shocks and scratches. The case includes a removable belt clip and a removable neck strap. Precision molded case to fit your iPod nano. Neoprene lining holds your digital music player securely in place, protects it against drops, shocks and collisions. Cutouts give easy access to headphone jack, remote port and all vital iPod controls. According to Charlie Bernstein, President of AudioOutfitters, LLC "This is the metal case iPod Video users have been waiting for and asking for. The ezArmor Video offers superior protection a stylish design, and includes a belt clip and neck strap so you can use your iPod. We are very proud of this new product." The ezArmor Video comes in two sizes 30 GB and 60 GB for a perfect fit. Both begin shipping today. The suggested retail price for the ezArmor for iPod is $34.98. ezArmor Video is available at various iPod resellers and distributors including MicroEnterprises and ezGear4u. PR: Slappa Distribution LLC., has announced the launch of its new Slappa SlipScreen for the iPod nano just in time for this year's CES trade show and the NAMM Show, where Slappa plans to exhibit this year at exhibit booth 7431. The Slappa SlipScreen for the iPod nano is designed with a sleek outer appearance to protect your iPod nano from daily abuse. Built out of a shock-absorbent and lightweight PU material, the SlipScreen offers complete click wheel coverage and Dock Connector access, with a removable belt clip for ez transport. Each SlipScreen package also comes with a free gift of Screen and Body Protectors for added scratch protection for your iPod nano. "We at Slappa decided to help out Apple by making the iPod even hotter, with much needed protection and individual personality," says Dustin Garis, Director of Marketing for Slappa. Slappa will be exhibiting at the 2006 NAMM Show in booth number 7431. The Slappa SlipScreen for the iPod nano is now available online for only $14.99 (MSRP $19.99). PR: XtremeMac, a leading manufacturer of iPod accessories, has debuted a new addition to its growing line of audio products, a high-end sound system dubbed Tango. The speaker system is designed to deliver the highest quality audio output from any Dock connector iPod, and offers audio/video output for integrating the iPod into a home entertainment system. Tango was designed specifically for the iPod, and though elegant in its simplicity and smaller than most audio components, it is a full featured 2.1 speaker system. Tango's trio of powerful speakers including a downward-firing subwoofer, provide deep powerful bass and crisp, clear vocals. A sound stabilizer provides grip on most surfaces so that bass vibrations do not cause the unit to shift. Tango can also be connected to a TV or home entertainment center for watching video content from iPods with video capabilities, via the built in 3.5 mm audio/video line out jack. The iPod's menus and functions can be navigated from the iPod itself or from across the room with the included wireless infrared remote. The unit also charges the iPod as it plays for unlimited playtime. "Tango is the newest member of our growing line of audio products for iPod." said Gary Bart, CEO of XtremeMac. "Our goal was to deliver phenomenal sound quality at any volume level, giving our customers the most flexibility in the way they use Tango, and we have succeeded in doing that." XtremeMac will display prototypes of the new system to consumers and press at the Macworld conference and expo in San Francisco next week. Tango carries a suggested retail price of $199 and is expected to ship by the end of March, 2006. PR: Speck Products has announced a new Electronics Division - expanding its innovative and unique line of iPod accessories to include electronics for iPod. Speck's new line of "made for your car" iPod electronics includes leather-clad iPod chargers, docks, and FM transmitters that are designed to compliment the look of your car's interior. "Most folks who are passionate about their iPods are also passionate about their cars," said Tim Hickman, General Manager of Speck Products. "Our new line of iPod electronics really integrates the iPod into your car. The leather and chrome details look great against your dashboard and leather seats. The typical white plastic FM transmitter just doesn't make sense with your leather interior." Use MobileCharge and MobileTune to power and charge your iPod from your car's cigarette adapter. You can use MobileTune's built-in FM Transmitter to play your iPod through your car stereo system. Mobile3in1 is a docking station that provides both charging power and FM Transmitter capabilities. All products are wrapped in fine quality leather with chrome accents and bright blue LED's to look great in your car. MobileCharge is priced at $39.95 and is availableonline (ships January 16th, 2006). MobileTune is priced at $59.95, will be available online in February 2006. Mobile3in1 pricing and release date are still unreleased. PR: Wurlitzer Jukebox and Vending, Inc. unveils the Wurlitzer One More Time (OMT) Special Edition for iPod CD Jukebox with a prominently featured integrated iPod Docking Station. Manufactured in Germany, the OMT Special Edition for iPod - featuring modern electronics, Bose Acoustimass Speakers and an iPod Docking Station - is the descendent of Wurlitzer's "Model 1015 jukebox - made popular in the postwar 1940s. The "icon of jukeboxes," the "1015 featured soothing rotating color tubes, mesmerizing bubble tubes, and a visible play mechanism that quickly became the focal point in coffee shops and diners across the nation. Incorporating an iPod Dock prominently on the front of the OMT Special Edition for iPod and providing easy access to all iPod controls, the OMT Special Edition for iPod is the ultimate accessory for the iPod. Playing the iPod through the OMT Special Edition for iPod is as simple as connecting the iPod to the dock. In addition to the iPod option, the OMT Special Edition for iPod is a fully capable CD jukebox with a CD changer that can hold 100 CDs stored vertically in a carousel. Featuring a CD priority system, programmed to override iPod play, the laser disc player mechanism is a high-quality Philips unit and the stereo amplifier features automatic level control and electronic overload protection. A touch-of-the-button, motor-driven page systems holds 60 CD title cards and a microprocessor controls all functions including credit and bonus steps as well as CD plays and automatic memory of most frequently selected songs. The OMT Special Edition for iPod can also be programmed to play entire CDs and there are connections for an additional amplifier, microphone, and external speakers. Although intended primarily for home use, the OMT Special Edition for iPod is equipped with a coin vend mechanism. A dollar-bill mechanism can be ordered as an option. An infrared remote control that controls jukebox functions is also available as an option. The cabinet is available in the traditional brown wood cabinet or in a high-gloss black or a brilliant white finish. According to General Manager Doug Skor of Wurlitzer Jukebox and Vending, Inc., "Our development of the OMT Special Edition for iPod with an integrated iPod Dock is designed to provide consumers with a platform to integrate what's become today's jukebox - the iPod - into posterity's quintessential jukebox. We recognize that a $9,500 list price targets a narrow consumer segment, but our research indicates that there is a market for the ultimate iPod accessory and we're excited to bring this wonderful jukebox to market." GM Skor adds, "Although the One More Time is a commercial machine, it's sold primarily to homes and makes for more of a fine piece of furniture that happens to play music. With the laws that regulate public performance, the iPod feature is not acceptable in a commercial application; however, for homeowners it's the ultimate iPod accessory." The OMT Special Edition for iPod is available now from Wurlitzer Jukebox and Vending, Inc. and home delivery and setup can be arranged through the national dealer network. PR: Clarion Corporation of America, a leading manufacturer of mobile entertainment systems, today announced enhancements to the full-featured control and functionality of the iPod interface for its newest VRX765VD and MAX675VD multimedia units. "Clarion is committed to providing products that offer innovative and technologically enriched features to improve the consumer experience in mobile environments," said Matt Matsuda, President of Clarion Corporation of America. "We strive to build upon great feature offerings like our iPod in-car solution, to expand the functionality as technology progresses." "The iPod has revolutionized the way consumers listen to music and watch video, and its popularity is driving great innovation in the Apple developer community," said Ron Okamoto, Apple's vice president of Worldwide Developer Relations. "We're delighted that Clarion has developed iPod compatible solutions that allow music lovers to enjoy the world's most popular music player in their car." Clarion's all-new VRX765VD single DIN 7 inch motorized flip-out touch- screen, is an improved version of its already awesome full-featured predecessor, the VRX755VD. The newest offerings of the VRX765VD multimedia unit are the video playback from the iPod, and touchscreen control of the DVD menu options. Its all-new appearance lends to its user friendliness. The VRX765VD will launch in February 2006 with an MSRP of $1,099.99. Clarion's MAX675VD double DIN Multimedia System with fully motorized 7 inch color widescreen LCD is an all-new product offering in 2006. Its touch- screen control offers a unique onscreen control pad with full iPod control of music functions and includes the video playback feature. The MAX675VD is Satellite Radio Ready and Navigation Ready, which means it can be connected with Clarion's new hard drive CeNET Navigation. The MAX675VD is scheduled for a mid-2006 consumer launch. PR: At the start of Macworld Conference and Expo today, XtremeMac announced a new voice recorder for the iPod with video. The recorder, called MicroMemo, utilizes the iPod's high-fidelity audio capabilities to record 16-bit audio via an included, removable microphone, or any compatible microphone with a 3.5 mm plug. Powered by the iPod's internal battery, MicroMemo features a microphone with a flexible neck for recording memos and other audio content directly into the iPod. It connects via the Dock connector at the bottom of the iPod and includes a built-in speaker for instant playback without headphones. XtremeMac notes that this is the first recorder developed to take advantage of the new iPod's high-fidelity capability and is the only recorder of its kind to offer a removable microphone and built-in speaker. MicroMemo also boasts a one-touch recording feature that activates the recording mode even when the iPod is in play mode. With the press of a button, MicroMemo automatically switches the iPod from play to record mode. "This is a groundbreaking device in the world of iPod accessories," said Gary Bart, CEO of XtremeMac. "MicroMemo adds a whole host of digital recording capabilities to the iPod, from simple voice memos to high quality digital audio from professional recording equipment. Now any audio device with a 3.5 mm connection can record directly to your iPod." MicroMemo is scheduled to begin shipping in late Spring 2006 and will sell for a suggested retail price of $79.95. PR: Who needs a PDA when you have an iPod? Transfer your PIM data to your iPod so it's available whenever you need it; iPDA supports transferring information from Entourage, Stickies, Mail, Address Book, and iCal. You can transfer Word, RTF, and text documents for quick access and reading on the go. You can even download RSS feeds, weather forecasts, and news headlines directly to your iPod. Transfer all or a subset of your Entourage events, contacts, messages, notes and tasks to your iPod. Select Entourage information by category (or folder for messages). Transfer all or a subset of your Stickies, Mail messages, Address Book contacts, and iCal calendars. Transfer Word, RTF and text documents for reading on your iPod. Includes all of your Calendar and Contact information. Fields not supported by the iPod (e.g. meeting locations and IM addresses) are included within the event/contact notes. Advanced filtering to control the information that gets transferred. Examples include date ranges for events, flagged contacts, unread (and/or flagged) messages and tasks based on whether or not they have been completed. Download RSS feeds. iPDA ensures that only unread articles are transferred to your iPod. Download weather forecasts and news. Subscribe to Internet published iCals for direct download and transfer to your iPod. For version 2.0 iPods messages, notes/stickies, tasks, news and weather forecasts can be transferred into your iPod's Notes. The information is organized by type and category to allow for easy navigation to all of your information. Notes longer than 4 KB are split into multiple notes. Notes are organized and linked to allow for easy navigation while reading. Events, tasks, weather forecasts and iCals can be transferred into your iPod's Calendar. Your calendar information will be organized into separate calendars based on category. Tasks can also be transferred to the To Do list found on 2.0 iPods. For version 1.x iPods, iCal To Do items can be transferred as entries in a "To Do" calendar. For version 1.x iPods, Contacts, messages, notes, tasks, news and weather forecasts appear as Contact entries. Long entries are logically split into multiple contacts. Sync all (or a subset) of your information to your iPod with a single click. Uses your filter settings to determine what information gets synced. Automate the syncing of your information by selecting automatic syncing on launch and automatic exit following a sync. Use iPod Launcher and connecting your iPod is all you'll ever have to do! Provides for manual transferring of information if you need more control over what gets transferred to your iPod. Locates your iPod and transfers information to the correct location within your iPod without asking you where it should go. Clean your iPod of all information within given iPDA categories. Try before you buy - you can transfer anything to your iPod prior to purchase. fixes incompatibility with Google Maps. iPod setup for "Disk usage"
PR: Have you been looking for a single solution that will enable you to conquer the Notes Capability that your iPod offers? memoPod is an all in one solution which will allow you to create and manage notes of any kind on your iPod. Create Exercise Plans, To-Do Lists, Driving Directions, Flight Plans, Recipes, News Items from within memoPod and then sync them to your iPod. You can also cut and paste any text from the application of your choice and sync that text to your iPod. When you take your iPod on the road - all that information will be available with the scroll and click of the wheel. Quickly and easily copy and paste this information into memoPod, sync it to your iPod and take it on the road with you. Create and Manage notes on your iPod: Exercise Plans, To-Do Lists, Driving Directions, Flight Plans, Recipes, News Items, etc. Create a database of Notes and easily sync them to your iPod. Create, Delete and Copy Notes on iPod using memoPod's Browser window. One Central Application - Finder and iSync not required. 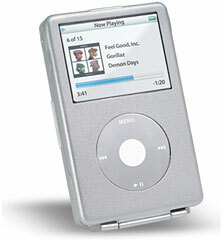 iPod which supports the iPod's Note Reader.